Cover art copyright 1999 by Thomas M. Sipos. Nicolae Ceausescu, who ruled over Transylvania and Rumania, was the only Communist dictator violently overthrown during the 1989-91 collapse of East European Communism. Controversy persists as to whether it was a spontaneous revolt -- or a coup engineered by his own Securitate (secret police). 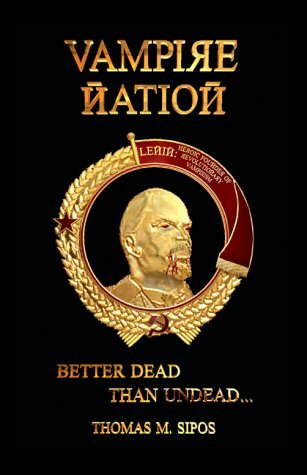 Vampire Nation is set amid the societal decay preceding Ceausescu's downfall. On a flight to Rumania, an American is inadvertently served blood, sensitizing his eyes to a surreal society of the undead, and revealing that Communism is vampirism. A dark fantasy/satire about Communism, in the tradition of George Orwell's Animal Farm. Based on Sipos's short story, "Vampire Nation," first published in Horrors! 365 Scary Stories (Barnes & Noble Books, 1998). Gruesomely hammers home the real evil of Communism, which was in some ways not that far removed from Sipos's gory fictional renderings. The image of the communist ruling class sucking the lifeblood of the very proletariat whom it claims to champion is a brilliantly evocative image and a powerful, original metaphor for Communism -- something one would have hardly thought possible to achieve after all that has been written on the subject in the past eight decades. Vampire Nation combines political dystopia, horror, espionage thriller, black comedy, even a Boy Meets Girl story. But surprisingly enough, all these elements hold together. The binding force is a single central idea: vampirism as the ultimate form of communism, in which blood is redistributed from producers to parasites. Romania in the last days of the Ceausescu regime provides exactly the right setting for this trope; Sipos even has a cameo for the ghost of Vlad Tepes, the medieval tyrant on whom Bram Stoker based the character of Dracula. A hallucinatory sequence near the end sketches a larger historical context in which all the great tyrannical regimes were actually run by monsters, with the French Revolution and Stalinism linked to vampirism and Nazism to lycanthropy. Sipos's work is exactly the sort of material small presses are meant for -- a little rough in spots but with some real substance. Anyone who likes political satire might find it worth a look. Vampire Nation attacks its subject matter from a libertarian perspective inspired by Ayn Rand, Ronald Reagan's shoot-from-the-hip witticisms, and a quirky sense of humor. ... It's a welcome relief from a world that thinks communism is just as cool and froody as capitalism. That somehow enslaving people in service to the state is actually a good idea. Heck, as recently as the Elian Gonzoles case, folks were asserting that communism is just another political system that's just as valid and moral as capitalism (if not more so). ... It's great to read a book that takes that collectivist BS and drives a stake through its oozing Red heart. A fast-paced satire so dark and bloody, and so graphic in horrible bloodsucking social and personal depravity, the average reader will likely reject it with a "Yik!" ... Yet [Sipos] writes well and creates a Bucharest of sinkhole, stomach-turning evil which is effective as horror. ... The novel succeeds in portraying socialists as a ghastly race of vampires literally sucking the lifeblood from the people. ... Altogether, this is a strange, flawed, interesting, 'politically incorrect' novel undoubtedly destined to be ignored by the mainstream media. Vampire Nation is a riveting, unique, superbly written horror novel, very highly recommended for all fans of the vampire genre. Henry Willoughby, a likeable if callow American, is the hero of Vampire Nation, a satiric horror fable about life in Communist Romania. Willoughby is invited to shoot a horror film in Transylvania. But from the moment he boards a Romanian flight, he encounters events that make him wish he'd stayed home. ... Luckily, Henry meets Anya, a rogue antivampire spy, and together they share adventures while overcoming evil (including horrific encounters with head vampires Nicolae and Elena Ceausescu and their truly disgusting son, Nicu). Sipos spins the familiar story of a naive American encountering European decadence but gives that familiar story his own personal (and sometimes ornery) twist. Vampire Nation both is and is not a horror novel. Sipos has thoroughly messed about with the genre, and has pulled it off superbly, with a razor sharp class. ... The book reads as if were written by Orwell, Stoker, Kafka, and Swift sipping spiked martinis over at King's place. Sipos has a unique voice, and although there is a sense of Animal Farm, 1984, The Castle, and Gulliver's Travels about Sipos's book, it holds its own as a Siposian creation. (A masterful and distinct enough work is Vampire Nation to coin a new adjective to describe it.) ... Somewhere between the howls of dying vampires, the political and social jabs, and the shots of guns, Sipos manages to guarantee it all falls together wonderfully as a page-turner. It might seem tempting to classify such a book as "enlightening," but Vampire Nation definitely is entertainment, and there is nothing wrong with that. Sipos mainly adheres to [historic] reality, giving Vampire Nation depth and giving the subgenre of vampire fiction a worthy addition. Stating at the outset, "This is a work of satire inspired by history," Sipos implies that his vampires are symbols, but he does not create mere stereotypes of villains. His vampires are fleshed out by the fact that such individuals and the horrific communist realm they created were very real. The author's list of relevant nonfiction works on communist Romania initially made me consider him a possible Kim Newman wannabe. Nothing could be further from the truth. While the grand pageant of history provides the backdrop for both authors, Sipos’ work can stand on its own. Willoughby and Amasovich begin a reckless ride throughout the Rumanian countryside killing communists, who also happen to be blood-sucking socialists. Altogether the novel can be divided into one part John Rambo, one part Blade, and one part Catherine Zeta Jones. ... The image of Willoughby and Amasovich running through the Transylvanian moonlight slaying communist vampires could probably be very profitable for some video game manufacturer.